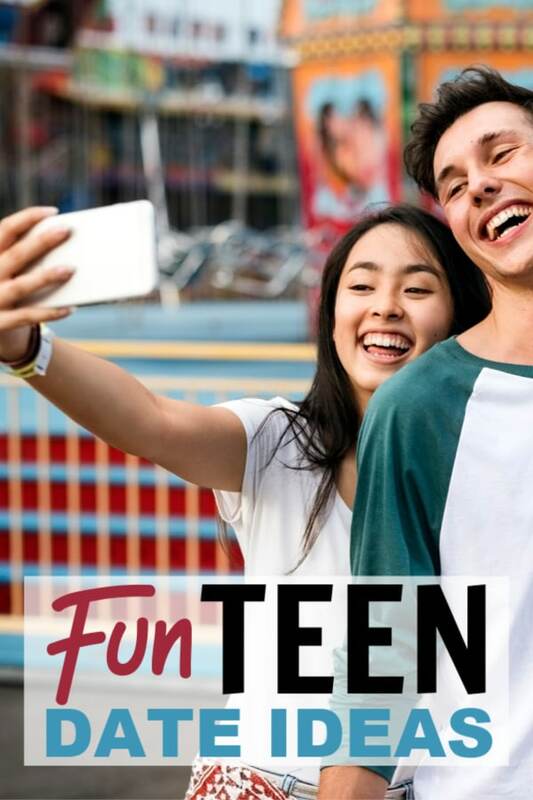 A reader asked me to come up with some Fun Date Ideas for Teens after reading my post about Indoor Teen Party Games. I thought it was a great question so I consulted my kids and their friends to come up with a list of ideas. Although many of the ideas in the list below are self-explanatory, some are not. So, I’ve tried to include a brief description of each idea to clarify. 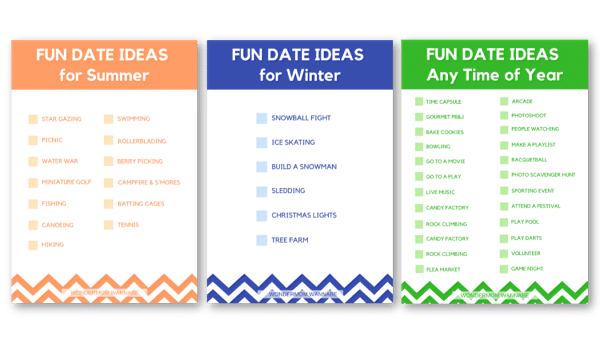 If you’re just looking for an easy-to-read list of these fun date ideas for teens, you can scroll to the bottom and grab a printable list that omits all the descriptions. Thanks to warm weather and time off from school, there are several fun date ideas that make the most of summer. Stargazing: Find a great spot away from city lights to lay back and check out constellations. Download an astronomy app on your smartphone beforehand to make the experience even more interesting. Picnic: Pack up some lunch and a picnic blanket and head to a local park. Bring along a frisbee and a portable speaker to round out the date. Water War: Load up some water balloons or water guns and buckets of water and head outside for a water war. Miniature Golf: This is a classic for a reason. Anyone can play, it’s hard to take a game called “putt putt” too seriously, and it provides plenty of opportunities to laugh and have fun. Fishing: All you need are a couple of fishing poles, some bait and a fishing hole. This is a low-key, relaxing way to spend time getting to know each other. Canoeing or Paddle Boating: Chances are there is a river or lake nearby where you can rent canoes or paddle boats. This is an easy activity that most people don’t do often so it makes for a fun date. Hiking: All you need are some good walking shoes and a trail. Head out to your nearest national or state park and pick a trail. Swimming: If you don’t have a backyard pool, head to a community pool, local swimming hole or a nearby lake. Rollerblading: If you have a good running/biking trail nearby, rollerblading is an easy and fun activity to do with someone else. Visit a Local Orchard or Farm to Pick Produce: Find a farm or orchard near you that lets visitors pick their own fruits and vegetables (see PickYourOwn.org). Then, visit one to pick your own berries, apples, etc. Campfire and S’mores: Find a safe place to build a campfire, then roast some marshmallows and make s’mores. Take turns telling ghost stories. Go to a Batting Cage: Unless one of you plays baseball, this will probably be a new activity for you. The concept isn’t hard (though hitting the ball may be) and it’s a fun way to burn some energy. Play Tennis: Grab a couple of rackets and some tennis balls and head to the nearest tennis court. It doesn’t have to be competitive if you don’t want. You can spend the time seeing how many times you can keep the ball going back and forth so you’re working as a team. Like summer, winter has unique features that provide many fun date ideas for teens that can only be enjoyed in colder weather. Snowball Fight: As long as you’re dressed for the snow, you just need some snow and a place to play that will keep innocent bystanders from being struck. Ice Skating: A simple Google search for “ice rinks near me” will help you locate a place where you can rent skates and hit the ice. Build a Snowman: This is so easy that most kids can do it and it’s a fun activity to do together. Even better, you can build a snowman almost anywhere as long as you have enough snow. Go Sledding: Grab a sled and find the nearest hill. Drive Around to See Holiday Decorations: This is a practically free activity (minus the cost of gas and wear and tear on the car) that is also fun and festive! Visit a Tree Farm: Pick out a Christmas tree and decorate it together. Several tree farms also provide sleigh rides, bonfires, and hot cider. Click here to find a tree farm near you. In addition to the ideas above, there are lots of fun date ideas for teens that are appropriate any time of year. Make a Time Capsule: This is a fun way to learn more about each other as you choose items to include. Make Gourmet PB&J Sandwiches: My oldest son says he can tell a lot about a girl based on what items she chooses (Cheezits on the sandwich are an immediate no second date choice in his book). Bake Cookies: Easy to make, delicious to eat, fun to share. This is a great way to spend an hour together. To extend the date, deliver the cookies to neighbors, friends, or a local fire station. Bowling: Not the most original idea, but it’s easy, can be a lot of fun, and doesn’t cost an arm and a leg. Go to a Movie: You can stick with the traditional date version, or switch it up and find a drive-in theater. If you’re willing to take some risk, find a theater that shows old movies or foreign films. Go to a Play: Find a local theater or go to a high school play. Go Somewhere with Live Music: Many coffee shops and restaurants have nights when they feature live bands and musicians. Find one that looks interesting and spend an hour or two enjoying the music. Visit a Candy Factory: It’s different, easy, and usually includes samples! Check this list for candy factory tours in your area. Go Rock Climbing: Find a local rock climbing wall (many are indoors so you can enjoy them regardless of bad weather) and tackle the feat together. Thrift Store or Flea Market: Head to a local flea market or thrift store and compete to see who can find the best outfit or gift for the best price. Arcade: Take each other on in video games, skeeball, and carnival games. Have a Photoshoot: Find an interesting spot (downtown, a park, a field, etc.) and take turns taking pictures of each other. Then, create a collage to share on Instagram. People Watch: Find a spot in a busy area (e.g. the mall or a subway station) and try to come up with stories about the strangers walking by. Create a Playlist Together: Take turns adding songs to a shared playlist. You’ll learn a lot about each other’s musical taste and share lots of memories. Play Raquetball: It’s a great workout, it’s played indoors so it doesn’t matter what the weather is like, and not many teens play it so it’ll be fun to learn and practice together. Photo Scavenger Hunt: Print off one or more of these lists and see how many items you can find and photograph. Go to a Sporting Event: No matter what season it is, there’s a sport that is in season. Go to a local (or school) game and cheer on the team together. Attend a Festival: Check your local paper or Festivals.com to find events near you. Whether it’s a food festival, music festival, or art festival, these are great events that are short-term opportunities. Play Pool: Though many pool tables are in bars, you can search for “billiards” to find a pool hall near you. Also, check local community centers. Play Darts: Invest in a dart board and you’ll always have a fun activity you can play with a date. Click here for a list of some of the most popular dart games complete with instructions and rules. Volunteer: Have a multipurpose date and use your time together to do something good for your community. It’s always more fun to do volunteer work with someone else, plus this is a great resume builder too! Have a Game Night: Pull out some of your favorite board games and make up new rules to make the games more interesting. For example, play Scrabble with only made up words and each person has to provide a definition for their made up word. Or, play several games and have a tournament to see who can win the most. Bookstore Challenge: Head to your local bookstore then split up to gather specific items from different genres in the store. For example, find a novel whose main character has your name. For ideas of items to locate, check out these bookstore date ideas. Escape Room: Also known as breakout games, these are fun challenges to tackle as a couple. Put your heads together to solve the clues in order to escape the room before time runs out. Want to keep this list of ideas handy for next time you’re trying to come up with something fun to do on your date? Download and/or print the entire list by clicking the image below. Looking for a fun group date? Grab this bundle of printable games made with teens in mind.